I just read this morning that there are 12 days until Christmas. This is right after I had convinced myself that I had lots of time left to get stuff done. But let’s not talk about that today. Today, I just want to post something non-holiday related that I made. 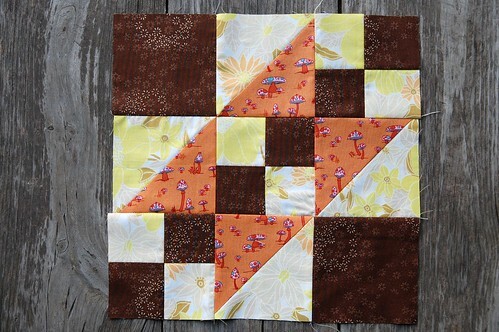 It’s a new quilt block for my Brown/Orange/Grey sampler quilt called, “Road to California”. I spotted it online here and thought it looked easy enough to give it a go. It was! I have to admit that making a sampler is completely relaxing. I just need to do one block at a time. I love it. I’ll be back again this week for a holiday giveaway. I’m hoping to somehow check about 50,000 things off my to-do list today. 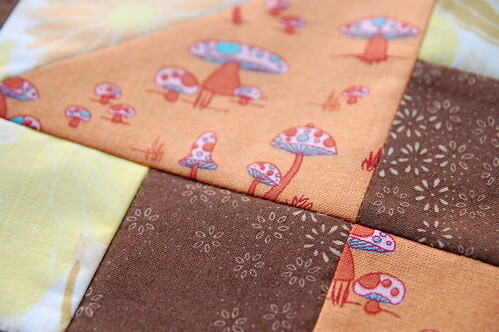 Love that block and the fabrics you chose. I may have to make one since our daughter’s college football team is going to play in Pasadena for the national championship. that is a gorgeous block!!! This quilt is going to be beautiful!!! wow that is just beautiful. your fabric choices rock! can’t wait to see it all…and maybe your attitude on samplers will rub off on me…i have 3 sampler quilts sitting around still in blocks! holy cats! I love it! But your corners are. so. square! I was just making a little wall-hanging of flying geese pattern (it will be on my blog after my mom gets it for Christmas) and I fought and fought to get my corners square. I ironed each seam before I went on. Any advice?? meant to link to my blog! here tis. I’ve just finished the quilt top for one of my son’s quilts and essentially it is a sampler – it was so much fun just playing around with different blocks and indeed, very relaxing.